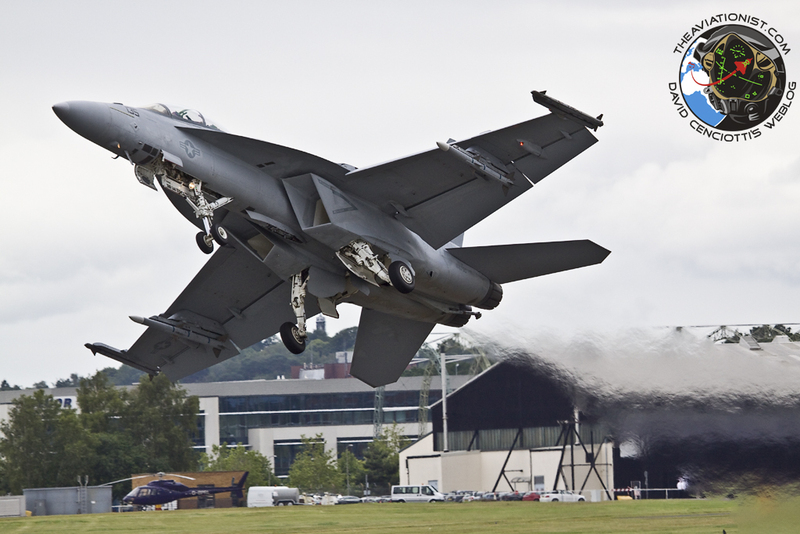 Here’s a cool picture of the Boeing F/A-18F of the U.S. Navy VFA-122 departing for the daily air display at Farnborough International Airshow. The multirole plane performed its display with a payload configuration hardly found on the Navy’s “Rhino”: 2x AIM-9X and 2x AIM-120 only. For instance, those embarked on the U.S. supercarriers within the Fifth Fleet Area Of Operation, flying sorties in support of OEF (Operation Enduring Freedom) in Afghanistan, carry at least the Advanced Targeting Forward Looking Infrared (ATFLIR) attached to the left intake and a JDAM and LGB on the underwing pylons.